Developing a so-called 'universal memory', or the perfect electronic memory, has long been the holy grail of electronic engineering. A universal memory should have a fast read and write speed, high reliability, low power consumption, and be compatible with other electronic components as well as non-volatile; that is, it should retain the data even when the device's power is switched off. Weijie Wang at the A*STAR Data Storage Institute, Singapore, and her co‐workers have now shown that nanometer-scale engineering of so-called phase-change materials could lead to just such a device. The atoms in phase-change materials, such as Ge2Sb2Te5 (GST), can arrange themselves into one of two configurations. These two 'phases' act as the ones and zeroes in digital information, and a pulse of electricity can change the material from one to the other. The ease with which GST changes phase, however, is both a blessing and a curse. On the plus side, it means that it can store data very quickly; but, on the down side, it is prone to switching phase unexpectedly and thus losing the data. "We have learnt how to create fast and stable phase-change memory technology that is scalable to nanometer sizes by developing a better understanding of the mechanisms that determine the atomic structure of these materials," says Wang. Phase-change random-access memory (PCRAM) is one of the most promising approaches to universal memory. Previous research has shown that adding nitrogen to GST, creating NGST, makes a more stable material, but also slows the phase-change process. Wang and her co-workers showed, however, that both high speed and high stability are possible simultaneously. They experimentally demonstrated that phase change in NGST became much faster by scaling down physically. "We developed a dual-scaling technique to reduce both the overall material volume and the size of the individual grains that make up NGST," she explains. 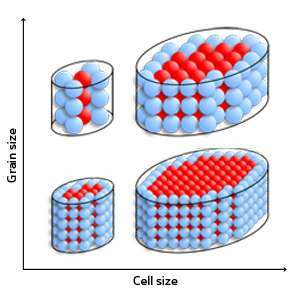 When the researchers deposited small-grain NGST into the pores of a thin film of silicon dioxide, they found that phase change in 20-nanometer-wide structures containing 5 nanometer grains was as much as 17 times faster than devices created in 200-nanometer pores. This increase in speed is because the mechanism that drives phase change is fundamentally different for smaller grains that are in smaller cells, owing to their higher surface-area-to-volume ratio. "In principle, this method is applicable to all types of phase-change materials," says Wang. "So, appropriate choice of device structure and phase-change material opens new opportunities for optimizing memory device performance."